An ideal tree to grow in the city or country is moringa (Moringa oleifera). Moringa will give you food, fodder, fuelwood and shade. Its pods make a tasty, nutritious vegetable. You can eat its tender leaves and flowers too. The leaves also make excellent livestock feed. Best of all, this useful tree grows quickly and easily in many different climates. You can almost always make space for a moringa tree. If you have no space at all to grow your own tree, see if you can get your neighbours’ help to grow moringa trees on common ground such as the roadside, beside a playground, or even around a garbage dump. The soft foliage and large bunches of scented white flowers will make the surroundings look pretty. And you can all share the pods, which can be harvested over several months of the year. The moringa tree needs lots of water but doesn’t like to be waterlogged. So the best place to plant it is near a drainage channel where its roots can reach the water but do not stand in it. It is often planted where waste water from the kitchen can be channeled past it. This way, the waste water is put to good use and no extra water is needed for the tree. Moringa grows best in sandy soil but will also grow in most well-drained soils. However, it does not grow well in stiff clay soils which can get waterlogged. And its growth will be stunted in dry, shallow soils. Moringa establishes best when it gets plenty of water, but once it is established it can survive severe drought. 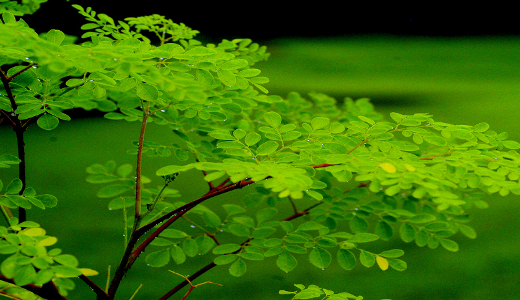 The easiest and fastest way to start a moringa tree is from branch cuttings. Even branches used as fence posts often take root and grow into full-sized trees. You can also grow moringa from seed, but this is a little more difficult and takes longer to give you a yielding tree. Try growing from seed if you cannot get branch cuttings. Researchers at the Kenya Forestry Research Institute found growth rates as high as seven metres in the first year from seed, with extremely high fruit yield. The main danger with seedlings is getting too much moisture before they become woody. Moringa branch cuttings will root without much care, but they grow best if you plant them at the start of the rainy season or another time when the weather is mild. Avoid planting cuttings in very hot or cold weather. Choose a healthy, mature tree from which to take your cuttings. If possible, find out which trees bear the largest number of pods and the best-tasting ones. Take cuttings from those trees. It is always better to take cuttings from several different trees rather than just one. This way, if a disease or pest strikes, some of your trees will have a better chance of surviving. Find a straight mature branch with some hard wood. Cut off about one metre from the end of the branch, just below a node. Then cut off the leaves and tender growing end of the branch, cutting just above a node. This is your branch cutting. If you have to climb the tree to get the cutting, be careful because the branches of moringa trees break easily. Dig a pit 50 centimetres wide, 50 centimetres long, and 50 centimetres deep. Place a layer of well-rotted manure on the bottom. Make a mound of sand about 15 centimetres high in the centre of the pit, and scoop out a hole in the mound to hold the cutting. Surrounding the cutting with sand helps to keep it from rotting and helps it to grow roots more quickly. Plant the branch cutting upright in the sand mound that you have scooped out. Pat the sand firmly in place around it. Fill the pit with the soil you have already dug out and press it firm. About 50 centimetres of the cutting should be underground. Water regularly, and take care to keep the soil moist but not soggy. Soon the cutting will start sprouting new growth. This means it has rooted. Water your new tree regularly until it is well established, and protect it from browsing goats and cattle. Use the green pods as a vegetable. Pick the pods when they are plump and firm but still tender. Cut them into pieces that are five centimetres long. Steam lightly. Eat the soft flesh and seeds inside and discard or compost the fibrous outer skin. Moringa is delicious cooked with spices and mixed with other vegetables such as eggplant, or legumes such as pigeonpea or cowpea. You can also cook the young flowers and tender leaves of the tree. But be sure to dry them completely after washing. Cover and cook the leaves and flowers in their own juices. If you add water to cook the leaves, they turn bitter. Make moringa a part of your regular diet. It contains many good nutrients such as calcium, iron, vitamin A, and vitamin C.
Moringa leaves make good nutritious fodder for livestock. Moringa wood is a soft wood. It cannot be used for building but it is good for fences, trellises and other light support poles. In fact, if you have a row of moringa fence posts, you will probably soon have a row of growing moringa trees which you can use as a living fence. Common names for Moringa oleifera include: horseradish tree, ben oil tree, benzolive, benzolivier, ben oléifère, bambou-bananier, graines benne (Haiti), drumstick (India), sohnja (India), resedà, ben, ángela, jazmín francés (Puerto Rico), palo de aceite, palo de abejas, libertad (Dominican Republic), paraíso (Mexico and Central America), murunga-kai (Philippines), malunggay (Philippines), saijhan (Guyana). Shaw Blvd. cor. St. Francis St. I am in U.S. and I am looking for pharmaceutical company/industry that would buy moringa oleifera seeds, leaves, flowers, or small trees from me. Do you have feasibility study for malunggay contract growers? We have a 4ha property in laguna. where can I sell dried malungay leaves and seeds? Is there a specific website that I can visit to check for the per kg price of the leaves and the seeds? Thanks so much! please contact me through E-mail. hello jane, the meralco foundation has conducted seminar with Bureau of Plant and Industry. check their website for further details. where can I attend training making malunggay capsule, tea. Compelling Reasons Why You Should invest in Gold Jewelry in the Philippines? © 2019 Business Diary Ph. All Rights Reserved. Theme by MyThemeShop.